WAIST HIGH: Hold Me, Close To Your Heart. Hold Me, Close To Your Heart. It was 25 years ago yesterday, on January 19, 1986, that a-ha achieved their only UK #1 hit with "The Sun Always Shines on TV," the third single from the band's debut album Hunting High and Low. Hunting High and Low sold 8 million copies worldwide and "The Sun Always Shines on TV" sold 5.5 million copies. Tim DiGravina, of All Music Guide, said about "The Sun Always Shines on TV," "If ever a 1980s song qualified as Wall of Sound, "The Sun Always Shines on TV" would be it. 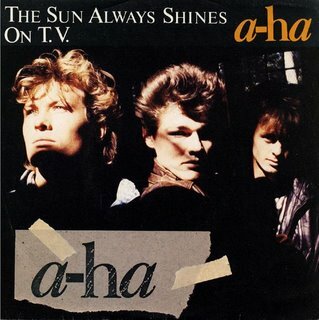 The video for "The Sun Always Shines on TV" seems to pick up where "Take on Me" left off.